Valentine's Day in our house is always celebrated as a family with treats for everyone as well as a favourite meal. My husband and I have never gone out on our own for Valentine's Day partly because of the expense and the restaurants are much too busy on the 14th of the month for our liking. This year I have decided to get together with some of my fellow bloggers and celebrate by giving back to you my wonderful readers by hosting a $400 USD World Wide giveaway to all my readers. Discover some new bloggers and enter to win below! Baby it’s Cold outside and we need a little bit of sweet nothings. This cash giveaway is a Blogger Sponsored Event which means the bloggers have donated money to help pay for this prize. One lucky reader will win! This giveaway is co-hosted by DownshiftingPRO AND MapleMouseMama along with The Knit Wit by Shair , Maple Leaf Mommy , The Bewitchin' Kitchen , Domesticated Momma , Shannon's View from Here , In R Dream , Thrifty Momma's Tips , Older Mommy Still Yummy , It's Just My Life , Mama Bear's Haven , Merry About Town , KickAss Living , Product Junkie , Life on Manitoulin , The Mommy Mix Naturally Cracked , Living with Dawn , MyBabyStuff , 1Heart1family , Lil Miss Kate, Powered by Mom. Kindly visit each one of the blogs for your chance to enter. Open WW but winner must have a PayPal account! We are giving away $400 USD cash! Terms & Conditions: This giveaway is in no way associated with Facebook. Giveaway is open to WORLDWIDE BUT MUST HAVE AN ACTIVE PAYPAL ACCOUNT. No other form of payment (bank transfer, cheque, credit or gift cards will be used - ONLY PAYPAL). There is one mandatory request that a comment must be left on the blog that you are entering on. The winner will be chosen at random and must have a confirmed winning entry in order to win the prize. If you are Canadian, you will have to answer a skill testing question in order to claim your prize. Quebec are excluded from entering this contest. To enter, just use the Giveaway Tools form above. If it doesn’t load after a minute or so, refresh your browser. VERY IMPORTANT NOTE: Only one IP address is eligible. 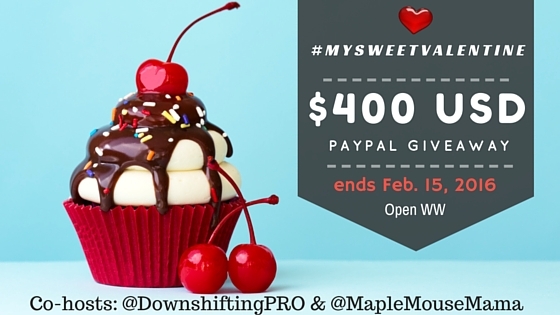 Giveaway ends February 15, 2016 at 11:59 pm PST Good luck!